Where there is smoke, there just might be fire!! The U.S. Anti-Doping Agency has brought formal doping charges against former cyclist Lance Armstrongin an action that could cost him some or all of his seven Tour de France titles. In the 15-page charging letter obtained by The Wall Street Journal, USADA, the agency that oversees antidoping efforts in Olympic sports in the U.S., said it spoke with “numerous riders, team personnel and others” who “will testify based on personal knowledge” of Mr. Armstrong’s alleged doping. As a result of the formal charges, Mr. Armstrong, a former rider with the U.S. Postal Service team, has been banned from competition in triathlons, a sport he took up after retiring from cycling in 2011. Mr. Armstrong can’t compete in triathlons until the charges are resolved. Getty Images Seven-time Tour de France winner Lance Armstrong attended the 2012 Paris Roubaix cycle race in Aprilin Paris. The doping charges follow an investigation by USADA into doping in cycling that lasted more than two years. The letter names several other individuals, including former doctors for Mr. Armstrong’s U.S. Postal Service team. Mr. Armstrong is the only athlete charged in the letter. The USADA charges aren’t criminal charges. The agency has the power to ban athletes from competition and to revoke previous titles. Athletes who are charged by USADA can request a hearing, and if they lose, they have the ability to appeal to the Court of Arbitration for Sport, an international arbitration body. 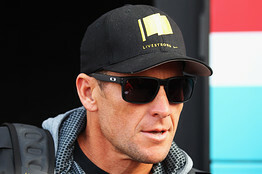 A person familiar with the matter said that the World Triathlon Corporation had been notified that USADA has initiated its case against Mr. Armstrong to determine if there is sufficient evidence of doping during his cycling career to bring forward charges. The WTC didn’t immediately respond to requests for comment. Its rules say an athlete is ineligible to compete during an open investigation. Agence France-Presse/Getty Images Lance Armstrong celebrates as he crosses the finish line and wins the 17th stage of the Tour de France in 2004. In February, federal prosecutors closed a nearly two-year criminal probe into alleged use of performance-enhancing drugs by Mr. Armstrong without charging him or other members of his former cycling team. Mr. Armstrong had been at the center of doping allegations, made in 2010 and 2011, by two ex-teammates, including Floyd Landis, who also rode with the now-defunct U.S. Postal Service team. The allegations by Mr. Landis sparked a federal probe of doping on the Postal team, although doping isn’t a violation of U.S. federal criminal laws.